A recent Facebook conversation with my favorite former Minnesotan, Bryan Thao Worra, centered around cultural comfort foods and culinary fusion. As more and more Southeast Asians (and other immigrants) locate in Minnesota, they will bring their comfort foods with them–laab meat, papaya salad, sticky rice, etc. Here in the midwest, we’ve already got plenty of our own comfort foods, such as shepherd’s pie, the infamous hot dish, and various jello and fruit conglomerations. to be used as a base ingredient for a variety of foods. Laabsanga (the b is silent) made for a perfect portmanteau, but dairy products aren’t that common in Hmong or Laotian cuisine. Laab chili could be good, but wasn’t quite Minnesotan enough. So I settled on “Laoperd’s Pie.” Shepherd’s pie was a favorite of mine growing up, and is a pretty easy dish to make. Plus, the base ingredients of seasoned meat and starches (rice with laab and mashed potatoes with the pie) made for a fairly risk-free fusion. 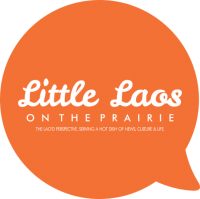 I stopped by the Bangkok Market on Lowry and Lyndale for the laab meat, and made small talk with the employees there about my upcoming kitchen venture. They politely told me how “that sounds like something nobody’s done before” because they eat laab cold, and that I would “have to tell them how it turned out.” Hey, I’m from Minnesota, home of the grape salad. I think I know when someone is politely telling me my recipe idea sounds culturally offensive at best. On the bright side, passive-aggressiveness is apparently a universal language. If you need a recipe for how to make laab meat, here’s my easy, two-step process. 1. Go to the Bangkok Market, 2. Buy laab meat. Four Thai chili peppers to add to the corn, although normal Minnesotans may want to add only one or two. And top it off with mashed potatoes. For this round of mashed potatoes, I took about six or eight red potatoes, boiled them, mashed them with milk and cream cheese, and added garlic and ginger for a little more Southeast Asian flair. And although mom’s recipe never called for fried onions as a topper, I couldn’t help but notice that the Bangkok Market carried what many Minnesotans put on top of just about anything cooked in a casserole dish. Topping off the Sheperd’s Laab with this accessory seemed apropos. I tossed the concoction in the oven to bake at 350 for about half an hour, and here was the finished product. A winter brew from Cheboygan, Michigan makes a good pair. And the verdict is…not too bad. Actually, after a few bites, I started to realize this was quite good. Surprisingly so. I mean, really tasty. I would absolutely make this again. Which I did, actually. 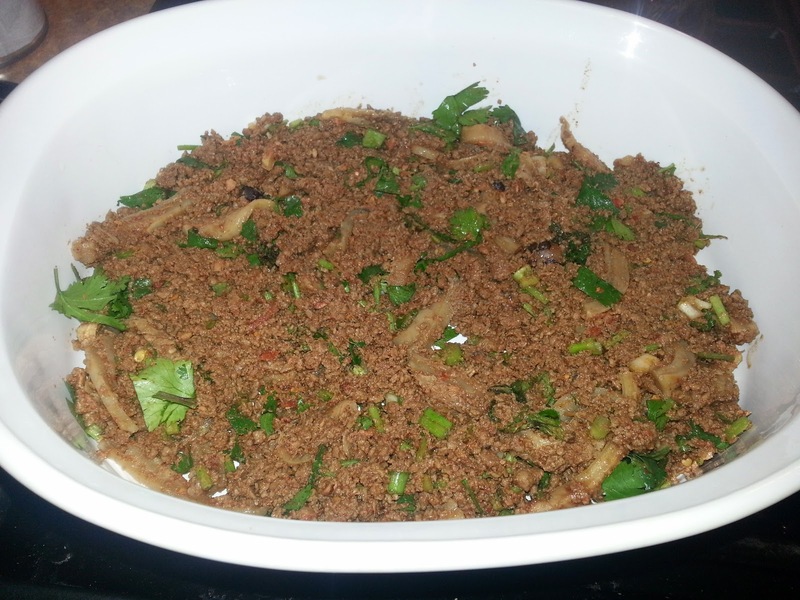 The lead photo showed two containers of laab meat, and the second round was laab chicken. That didn’t turn out nearly as well. In part, perhaps because I have never used anything except beef as the meat base for shepherd’s pie, and also to be quite honest, the laab chicken at the Bangkok Market isn’t nearly as good as the beef (or duck if you can get it; not that I would recommend laab duck for this dish). But Shepherd’s Laab with beef is a winner. What’s next? Laabtertot casserole? After this adventure, I’d say that mixture is first in line. Agar-agar with canned mandarin oranges and cool whip? We’re going downhill fast. Dried squid soaked in lye for a few days? Nah, nobody’s that crazy.